SPOKANE -- It's not often the United States serves as a dumping ground for a foreign factory, but that is happening in the remote northeast corner of Washington. 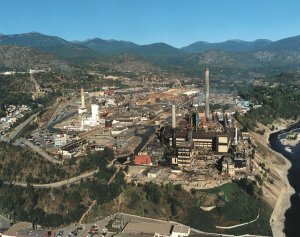 The Environmental Protection Agency is trying to force a Canadian company to clean up decades of toxic smelter wastes that have flowed down the Columbia River into Lake Roosevelt in the United States. The EPA recently broke off talks with Teck Cominco Ltd., saying the Vancouver, British Columbia-based company was not serious about cleaning up the wastes, and is now pursuing legal action. Not since the Pig War of 1859 between the United States and Great Britain has there been such an international brouhaha in the Pacific Northwest. That dispute, over who owned San Juan Island, cost the life of a British pig before Kaiser Wilhelm I of Germany decided the United States owned the island. The current dispute may also require high-level intervention. "Lake Roosevelt presents a unique opportunity for environmental cooperation between our two countries," Teck Cominco Chief Executive Officer David A. Thompson wrote in a letter to EPA in Seattle. But in the same letter he insisted his company does not have to meet all requirements of U.S. environmental law because it operates entirely in Canada. The EPA opposes that position, contending that since the wastes ended up in the United States, Teck Cominco is required to clean them to American specifications. The agency acknowledged it may be breaking new legal ground. "We do have a valid legal theory for how to do so, but the nature of it is precedent-setting or close to it," said Dave Croxton, the EPA's regional cleanup manager in Seattle. In response, Teck Cominco is seeking diplomatic resolution. "We have raised the matter with the government of Canada and they have indicated their need to deal with their counterparts in the government of the United States," Thompson said. Earlier this month the EPA formally warned Teck Cominco that it should agree to the agency's demands, or prepare to be sued. The company replied that the EPA effort could backfire, with U.S. companies finding themselves in legal trouble with Canada over cross-border pollution. At issue is the company's giant lead and zinc smelter on the banks of the Columbia River in Trail, B.C., 10 miles north of the U.S.-Canada border. The EPA contends the smelter is the largest source of metals pollution in Lake Roosevelt, a reservoir created when the river was blocked behind Grand Coulee Dam in 1937. A smelter has been operating at the site since the early 1900s, with the latest replacement built in 1997. Last year, an EPA study of sediment samples concluded the portion of the lake from Inchelium to the Canadian border already qualified for Superfund listing because of hazards to aquatic life from heavy metals. The metals flow down the river into Lake Roosevelt. The reservoir is a national recreation area used by 1 million boaters, swimmers and fishers each year. Smelter operations have dumped an estimated 10 million to 20 million tons of slag into the river. Slag is a smelting byproduct that contains lead, arsenic and mercury. Exposure to heavy metals can cause brain and kidney damage, behavioral disorders, blindness, deafness, and mental retardation. Children and fetuses are especially sensitive. The EPA is launching a study of the extent of the pollution. The study is expected to take four years and cost $10 million. The agency will pursue legal action against Teck Cominco Ltd. in U.S. federal court to recover those costs, plus $1.8 million it has already spent studying the pollution. Environmentalists are cheered by the action. "Teck Cominco has illegally treated our Columbia River as their sewer and Lake Roosevelt as their cesspool," said Bob Jackman of Citizens for a Clean Columbia, an environmental group. "For decades, Teck Cominco has been a bad corporate neighbor." Teck Cominco has contended the pollution came from several sources and it shouldn't be saddled with all the costs.